Let the battle of the cinnamon-flavored whiskeys begin. The next time you’re tipsy at a bar, and feel inclined to buy a round of hot cinnamon whiskey shots for your friends, you’ll have a couple options to choose from. 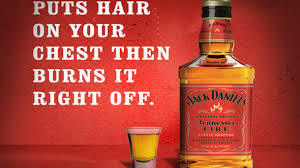 Jack Daniel Distillery released its Jack Daniel’s Tennessee Fire cinnamon whiskey to stores nationwide Tuesday, following a limited release last year. The whiskey, dubbed “Jack Fire,” is a mix of Jack Daniel’s Old No. 7 Tennessee Whiskey and Jack Daniel’s own cinnamon liqueur.